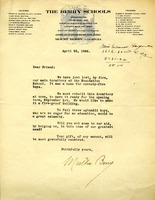 The boys dormitory burned down and Martha Berry writes a letter to her friend in hopes of having it rebuilt by the September term. 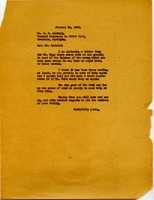 This is a letter to Miss Berry from the Three Trails Chapter, with three dollars enclosed. The author is also sorry for Miss Berry's recent crop failure, and wishes they could send The Berry Schools more money. The first paragraph contains only 2 sentences. She is writing how she speaks, and not the SAE sentence structure. In the second paragraph as well, there is a run on sentence. Again, Berry seems to be writing how she speaks. Maybe this is to give more emotion to the letter: to make it more informal. She even addresses the recipient as "friend." The letter is meant to grasp at the recipients heart and emotions. It is very persuasive in this effect. 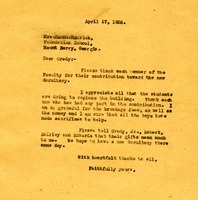 Martha Berry asks Grady to thank every faculty member and student who recently gave money for the new dormitory.